Republic of Finland (Suomi or Suomen tasavalta in Finnish, Republiken Finland in Swedish) is a country of northern Europe known for its largely social democratic economic system. The state capital is Helsinki and the principal exports are machines, electronics and forestry products. Finnish is the principal language spoken, a Finno-Ugric language. Like many nations that do international business, or have a strong tourist trade, many Finns speak English to facilitate communication with other countries. The second official language is Swedish, which has the same status as Finnish in the country. Finland is known as "the land of lakes". The area of Finland is 390 908 square kilometers, consisting of 303 919 km2 of land, 34 533 km2 of lakes and 52 456 of sea. The north-south axis is 1157 kilometers and west-east axis 542 km. Most of the landscape is covered with lakes and forests. Finland is often called the "Land of Thousands of Lakes", which is true because the number of lakes in the country exceeds 188 000, of which about 56 000 have an area of one hectare or more. In the sea, there are more than 3 000 islands. Cultivated land and habitation only account for 17% of the land area, rest being mainly Norway spruce forests. Around 75% of the land is covered by forest and 10% is covered by water. The tallest mountain is Halti with a height of 1324 meters. The longest river is Kemijoki with a length of 500 km. Finland is bound by 614 km of common border with Sweden in the Northwest, 736 km with Norway in the North,1340 km Russia in the East, the Gulf of Finland in the South and the Gulf of Bothnia in the West. Population (August 2017): 5.5 million. Ethnic groups: Finns, Swedes, Sami, Roma, Tatars. Religions: Lutheran 70.9%, Orthodox 1.1%, Pentecostal 0.9%. Languages: Finnish 87.9%, Swedish 5.2% (both official); Sami 0.03%, Russian 1.4%. Education: Years compulsory—9. Attendance—almost 100%. Literacy—almost 100%. Health: Infant mortality rate—2/1,000 (2015). Life expectancy—males 78.7 yrs., females 84.2 yrs. Average family size: 2.8 persons. Average age at birthgiving: 29.1 yrs. Workforce (2.7 million; of which 2.5 million are employed): Public services—32.8%; industry—19%; commerce—15.6%; finance, insurance, and business services—13.8%; agriculture and forestry—4.7%; transport and communications—7.4%; construction—6.7%. The Finnish people make do with a three-tier system of universal health care, and one's position in the streams is based on demographics. The system is funded by Finland's remarkably high taxation rate. Yyteri beach during Yyteri Beachfutis. Finnish people (Finns) are known for their love of nature. Nature is prominent in the works of Finnish artists, such as Jean Sibelius, Aki Kaurismäki, Alvar Aalto. The great masters of Finnish literature include Mika Waltari, Väinö Linna, Johan Ludvig Runeberg. Finland is a bi-lingual country and has produced its literary heritage in both Finnish and Swedish. The beloved Moomintrolls were created by the writer and graphic artist Tove Jansson. Another important facet of traditional Finnish culture is the love of the Finnish sauna. Northern Finland is home to a culture called the Sami people, or Laplanders, which are known for wearing red clothing and herding reindeer. Santa Claus is based on this culture. They are considered a high context culture. The Kansallisbiografia, or National Biography of Finland, is a collection of the biographies of 6,000 Fins who have made significant contributions to the development of Finnish society. The collection can be found online or in a ten-volume paper copy. The most popular sport in Finland is ice hockey and their national team has won a number of world titles in that sport. Finland is perhaps most successful, however, in skiing competitions of all disciplines including downhill, cross-country, ski-jumping and aerial skiing. Motorsports are also popular in Finland and the country has produced three formula 1 world champions: Keke Rosberg, Mika Hakkinen, and Kimi Raikkonen. Finland has also won the most World Rally Championships (14) by seven different drivers like Juha Kankkunen and Tommi Mäkinen (both won 4 times). Finland currently numbers 5,513,130 inhabitants and has an average population density of 18 inhabitants per square kilometer. This makes it, after Norway and Iceland, the most sparsely populated country in Europe. Finland's population has always been concentrated in the southern parts of the country, a phenomenon even more pronounced after 20th-century urbanization. The share of foreign citizens in Finland is 4.5% (2017) being among the lowest of the European Union countries. Most of them are from Russia, Estonia, and Iraq. The share of foreign languages is 6.77% and the percentage of finish speakers have been declining since 2013. Among newborns, the percentage of finish speakers is in decline since 1992. Most Finns are members of the Evangelical Lutheran Church of Finland (70.9%, 2017). With approximately 3.7 million members, the Evangelical Lutheran Church of Finland is one of the largest Lutheran churches in the world. A minority belong to the Finnish Orthodox Church (1.1%; see Eastern Orthodox Church) and Pentecostal (0.9%). Other Protestantism denominations and the Roman Catholic Church in Finland are significant. Even though the membership in the main Lutheran church is high, the population is not highly religious. Polls suggest that 28-60% of the population to be either agnostics or atheists. Constitutionally, the 200-member, unicameral Eduskunta is the supreme authority in Finland. It may alter the constitution, bring about the resignation of the Council of State, and override presidential vetoes; its acts are not subject to judicial review. Legislation may be initiated by the president, the Council of State, or one of the Eduskunta members. The judicial system is divided between courts with regular civil and criminal jurisdiction and special courts, with responsibility for litigation between the public and the administrative organs of the state. Finnish law is codified. Although there is no writ of habeas corpus or bail, the maximum period of pretrial detention has been reduced to 4 days. The Finnish court system consists of local courts, regional appellate courts, a Supreme Court, and a Supreme Administrative Court. Finland consists of five provinces and the self-ruled province of the Aland Islands. Below the provincial level, the country is divided into cities, townships, and communes administered by municipal and communal councils elected by proportional representation once every 4 years. At the provincial level, the five mainland provinces are administered by provincial boards composed of civil servants, each headed by a governor. The boards are responsible to the Ministry of the Interior and play a supervisory and coordinating role within the provinces. Finland's defense forces consist of 35,000 persons in uniform (26,000 army; 5,000 navy; and 4,000 air force). The country's defense budget equals about 1.3% of GDP. There is universal male conscription under which all men serve from six to 12 months. As of 1995, women were permitted to serve as volunteers. A reserve force ensures that Finland can field 490,000 trained military personnel in case of need. Finland's proportional representation system (D'Hond method) encourages a multitude of political parties and has resulted in many coalition governments. Political activity by communists was legalized in 1944, and although four major parties have dominated the postwar political arena, none now has a majority position. In elections held in 2015, the Center Party (Keskusta, or KESK), traditionally representing rural interests, became the largest party again, seeing large electoral gains. The conservative Finns Party (Perussuomalaiset, or PS, formerly known as the True Finns) became the second largest in the country, although it lost a single seat. The Center Party then formed a three-party governing coalition with the right-of-center National Coalition (Kokoomus, or KOK) and the Finns Party, though the latter split and was kicked out of the coalition in 2017 after more consistent conservatives took control of the party. The Social Democratic Party (Sosialidemokraattinen Puolue, or SDP) suffered a defeat in the election and fell to fourth place. Finland's basic foreign policy goal from the end of the Continuation War with the Soviet Union in 1944 until 1991 was to avoid great-power conflicts and to build mutual confidence with the Soviet Union. Although the country was culturally, socially, and politically Western, Finns realized they must live in peace with the Soviet Union and take no action that might be interpreted as a security threat. The dissolution of the Soviet Union in 1991 opened up dramatic new possibilities for Finland and has resulted in the Finns actively seeking greater participation in Western political and economic structures. Finland joined the European Union in 1995 and euro in 2002. The Uspenski cathedral of Helsinki; with its golden cumpolas and redbrick façade, the cathedral is one of the clearest symbol of the Russian impact on Finnish history. Finland and the Soviet Union signed a peace treaty at Paris in February 1947 limiting the size of Finland's defense forces and providing for the cession to the USSR of the Petsamo area on the Arctic coast, the Karelian Isthmus in southeastern Finland, and other territories along the former eastern border. Another provision, terminated in 1956, leased the Porkkala area near Helsinki to the Soviet Union for use as a naval base and gave free access to this area across Finnish territory. In April 1948, Finland signed an Agreement of Friendship, Cooperation, and Mutual Assistance with the Soviet Union. Under this mutual assistance pact, Finland was obligated—with the aid of the Soviet Union, if necessary—to resist armed attacks by Germany or its allies against Finland or against the USSR through Finland. At the same time, the agreement recognized Finland's desire to remain outside great-power conflicts. This agreement was renewed for 20 years in 1955, in 1970, and again in 1983 to the year 2003, although the subsequent dissolution of the Soviet Union led to the agreement's abrogation. The Finns responded cautiously in 1990-91 to the decline of Soviet power and the Soviet Union's subsequent dissolution. They unilaterally abrogated restrictions imposed by the 1947 and 1948 treaties, joined in voicing Nordic concern over the coup against Soviet leader Mikhail Gorbachev, and gave increasing unofficial encouragement to Baltic independence. At the same time, by replacing the Soviet-Finnish mutual assistance pact with treaties on general cooperation and trade, Finns put themselves on an equal footing while retaining a friendly bilateral relationship. Finland now is boosting cross-border commercial ties and touting its potential as a commercial gateway to Russia. It has reassured Russia that it will not raise claims for Finnish territory seized by the Soviet Union and continues to reaffirm the importance of good bilateral relations. Finnish foreign policy emphasizes its participation in multilateral organizations. Finland joined the United Nations in 1955 and the EU in 1995. As noted, the country also is a member of the North Atlantic Treaty Organization's (NATO) Partnership for Peace as well as a member of the Euro-Atlantic Partnership Council. As a NATO partner, Finland had 100 troops in Afghanistan as of September 2007. Finland has an industrial economy based on abundant forest resources, capital investments, and high technology. The Finnish economy has made enormous strides since the severe recession of the early 1990s. Finland successfully joined the euro zone and has outperformed euro-area partners in terms of economic growth and public finance. In the last few years, the Finnish economy has performed reasonably well. Total output was 5% higher in 2006 than in 2005, but economic activity leveled off in the latter half of the year. GDP is predicted to grow by 4.4% in 2007, while 2008 is likely to show a slower rate of growth, estimated at 3.3%. Despite the current favorable outlook, there is a degree of uncertainty in the Finnish economy caused by the large fluctuations in electronics industry production, together with resource constraints. Cost and price pressures have increased, and there is a threat of industry’s price competitiveness starting to weaken. Unemployment decreased significantly from 1994 to 7.7% in 2006 and is expected to drop to 6.7% in 2007. A relatively inflexible labor market and high employer-paid social security taxes hamper growth in employment. Labor bottlenecks are becoming more common in certain sectors, and this will increasingly restrict growth in output in the future. The main constraint to medium-term economic growth will be the drop in the population of working age once the post-war baby boomers reach retirement age. The headquarters of Nokia Corporation in Keilaniemi, Espoo, 2005. Exports of goods and services contribute 32% of Finland's GDP. Metals and engineering (including electronics) and timber (including pulp and paper) are Finland's main industries. The United States is Finland's third most important trading partner outside of Europe. With a 3.8% share of imports in 2006, the United States was Finland's seventh-largest supplier. The total value of U.S. exports to Finland in 2006 was $2.6 billion. Major exports from the United States to Finland continue to be machinery, telecommunications equipment and parts, aircraft and aircraft parts, computers, peripherals and software, electronic components, chemicals, medical equipment, and some agricultural products. The primary competition for American companies comes from Russia, Germany, Sweden, and China. The main export items from Finland to the United States are electronics, machinery, ships and boats, paper and paperboard, refined petroleum products, telecommunications equipment and parts. In 2006, the United States was Finland's fourth-largest customer after Germany (11.3%), Sweden (10.5%), and Russia (10.1%), with an export share of 6.5%, or $5 billion. However, trade is only part of the totality: the 10 biggest Finnish companies in the United States have a combined turnover that is three times the value of Finland's total exports to the United States. About 2.3% of the Finnish GDP comes from exports to the United States. GDP consists of 70.2% services, 27.1% industry and 2.7% primary sector. National debt is around 60% of GDP and €19,370 per person. Overall tax level is 43.4%. Agriculture, forestry, fishing and hunting: Products—meat (pork and beef), grain (wheat, rye, barley, oats), dairy products, potatoes, rapeseed. Industry: Types—metal (including electronics and electrical equipment) and engineering, forest products, chemicals, shipbuilding, foodstuffs, textiles. Trade: Exports—€60 billion. Major markets—Germany 14.2%, Sweden 10.3%, Nederlands 6.9%. Import--€62 billion. Major suppliers—Germany 15.5%, Russia 13.2%, Sweden 11%. The origins of the Finnish people are still a matter of conjecture, although many scholars argue that their original home was in what is now west-central Siberia. The Finns arrived in their present territory thousands of years ago, pushing the indigenous Lapps into the more remote northern regions. Finnish and Lappish—the language of Finland's small Lapp minority—both are Finno-Ugric languages and are in the Uralic rather than the Indo-European family. Finland's nearly 700-year association with the Kingdom of Sweden began in 1154 with the introduction of Christianity by Sweden's King Eric. During the ensuing centuries, Finland played an important role in the political life of the Swedish-Finnish realm, and Finnish soldiers often predominated in Swedish armies. Finns also formed a significant proportion of the first "Swedish" settlers in 17th century America. Following Finland's incorporation into Sweden in the 12th century, Swedish became the dominant language, although Finnish recovered its predominance after a 19th-century resurgence of Finnish nationalism. Publication in 1835 of the Finnish national epic, The Kalevala—a collection of traditional myths and legends—first stirred the nationalism that later led to Finland's independence from Russia. 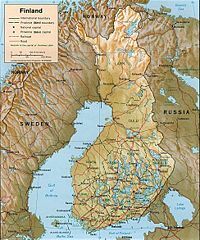 In 1809, Finland was conquered by the armies of Czar Alexander I and thereafter remained an autonomous grand duchy connected with the Russian Empire until the end of 1917. On December 6, 1917, shortly after the Bolshevik Revolution in Russia, Finland declared its independence. In 1918, the country experienced a brief but bitter civil war that colored domestic politics for many years. During World War II, Finland fought the Soviet Union twice—in the Winter War of 1939-40 and again in the Continuation War of 1941-44. This was followed by the Lapland War of 1944-45, when Finland fought against the Germans as they withdrew their forces from northern Finland. During the Continuation War (1941-1944) Finland was a co-belligerent with Germany. However, Finnish Jews were not persecuted. Of the approximately 500 Jewish refugees who arrived in Finland, eight were handed over to the Germans, for which Finland submitted an official apology in 2000. Also during the war, approximately 2,600 Soviet prisoners of war were exchanged for 2,100 Finnish prisoners of war from Germany. In 2003, the Simon Wiesenthal Center submitted an official request for a full-scale investigation by the Finnish authorities of the prisoner exchange. It was established there were about 70 Jews among the extradited prisoners but none was extradited as a result of ethnic background or religious belief. Treaties signed in 1947 and 1948 with the Soviet Union included obligations and restraints on Finland vis-a-vis the U.S.S.R. as well as territorial concessions by Finland; both have been abrogated by Finland since the 1991 dissolution of the Soviet Union. The city of Helsinki won the right to host the 1952 Olympic Games and experienced a brief economic boom. As is often the case with host nations, it was subsequently followed by a period of depression, commonly referred to as the Olympic "hangover". ↑ Aunesluoma, Juhana; Heikkonen, Esko; Ojakoski, Matti (2006). Lukiolaisen yhteiskuntatieto (in Finnish). SanomaWSOY. This page was last modified on 8 September 2018, at 23:40.